Feeling: More excited than ever, now that we know the babies gender! Best Moment: There are so many wonderful things that have already happened throughout my pregnancy, but I must say, finding out the gender of Baby G and being able to envision our future with this little peanut is just an amazing, astounding feeling. Bryan and I keep talking about all of the things that we want our child to experience in life, big and small... and everything that we're hoping to experience with them. To put it bluntly, sh!t becomes real when you find out the gender... and it couldn't be more of a thrilling feeling! Memorable Moment: I won't see my mom much during my pregnancy, maybe 3 more times before the baby comes, so being able to shop for my little one with her was a definite highlight. I had so much energy that day and felt like I was floating around the racks of clothes knowing that we were buying clothes that my baby will one day wear. All I wanted to do was shriek and squeal, but I did my best to keep my cool around my mom by just "oohing and awing", as I think she would have thought I was nuts... I'll save the goofy giddiness for when I shop with Bry, haha! Thanks to my mom, this kid's got a lot of clothes already... and we've only known the gender for a week! Congrats! Don't worry about feeling the baby move early- once it starts it won't stop! I'm almost 32 weeks and some days I wonder if he ever sleeps with all the kicks and jabs I get around the clock. Maybe this is just me but eventually I grew to hate maternity jeans (Gap) they fall down constantly. My sweet mother bought me a pair of Seven's maternity leggings (from Pea in the Pod and thick like riding pants) and they are AMAZING. Heidi Klum makes a cheaper version for Motherhood Maternity I think. Stay comfortable and have a wonderful time with your husband during all this! YAY! instead of the rubber band buy the BeBands at Target. They're a lifesaver in the 2nd trimester. I LOVE the way you told Bryan!! I would have been SO anxious I would have had to drive to his work to tell Beau lol. Can't wait to find out what it is!!! I'm guessing girl! I can't wait to find out what baby G is! I am with steph and guessing a girl as well! awww congratulations! i've been in and out of the blogging loop. must've missed your pregnancy announcement. so exciting! YAY! I love reading these! I first felt our baby right around 16 weeks EARLY in the morning. I was just really still & felt a little tingle! You'll feel him/her soon enough! It will be really fun when B can feel the baby too! I laughed when I saw you're missing salami. This is something I didn't expect to miss, but I missed it almost immediately & still do. I didn't even eat it that much before being pregnant! Ha! 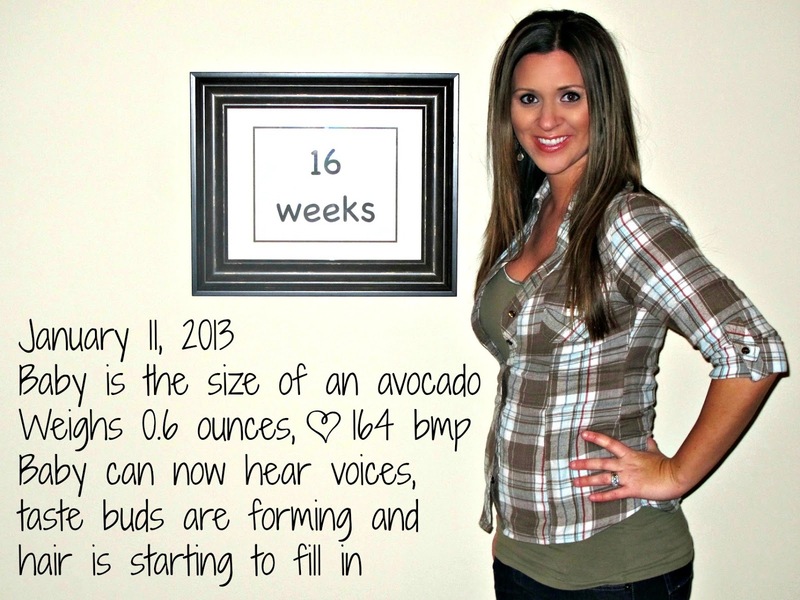 Eeeeks I cannot wait to hear if you're having a little girl or boy! You're really the first blogger friend that I have that I've known (through Bloggerland) for a while prior to getting pregnant, so I just feel that much more excited reading about the next part of your journey!! I just read your posts about how you told your husband. It brought tears to my eyes, I remember exactly the day we found out we were pregnant and that was 3 years ago! I took 7 tests to make sure.... I was that excited! I am so happy for you, this is such a beautiful little blessing. Everyday will bring something new..... even when they are 3 years old! I remember I tried so hard to feel something, I was so eager and then it hit... OMG! She was so extemely active and hiccups..... I will still never forget that feeling. So just be patient... it will happen! God Bless you! This is an amazing part of life. I hope you don't have have to suffer from vomiting for much longer. Yay for knowing what you're having. So exciting! this is SO exciting!! I saw the announcement pic on insta and was so happy for you! you are going to be the cutest pregnant lady ever! SO fun!!! You look amazing!! We do a weekly picture too!! I hope you start feeling better soon. I started feeling movement right around 17 weeks! Looking good, still can't see a bump. Cute outfit. Can't wait to find out what the baby is. Thinking a boy. You look so beautiful! I can't wait to see some of the maternity outfits you show everyone once you outgrow your regular clothes. You look great! Can't wait to hear if you are having a boy or a girl! You are glowing!!! I am so sorry to hear about getting sick...I was the same way for the first 22 weeks...ick!! I never craved anything either, but I definitely had aversions. :) I cannot wait to find out the gender!! Love this! :) You look adorable and so happy! You are just glowing! I'm so happy for y'all!! I can't wait to know the gender! I actually didn't feel any movement until 22 weeks! I guess it's just different for everyone...and depends on how active the baby is!